Doing a little of summer reading? 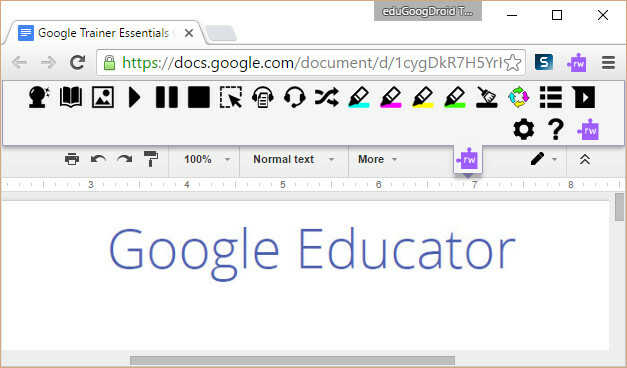 If you are using your Chromebook, this add-on will help. I'm a teacher. However, I have always had difficulty reading. You can probably tell by the way my blog-posts words and phrases are framed. An important way to help students ready and speak is by learning the proper pronunciations. It has happened to me that I have read some word many times. Several years later, I didn't recognize the word because I've never heard it out loud. Then, I go back to re-reading the word I have always read, and I didn't recognize the spelling. You do not atcaluly raed the whloe wrod ervey tmie. Atfer laenrnig the wrod, you scan trhugoh and repacle the lteetrs in yuor haed. You sohuld sitll be albe to raed the wdors eevn if the lteetrs are out of pclae. Ponhes are not the olny ones wtih wrod peridticon. This add-on  provides an easy way for students to hear what they are reading. It definitely helps me. plus, it's free for teachers . It works great on Google Docs, PDF files, and websites. From reading, to highlighting, to definitions, it is a great product.